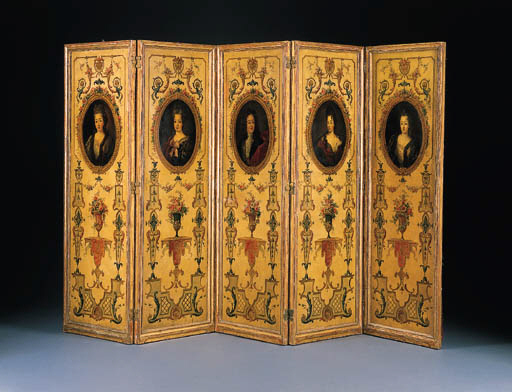 Designed in the Louis XIV arabesque manner, these panels are inspired by Jean Bérain (d.1711), who succeeded as Dessinateur de la chambre et du Cabinet du Roi in 1674. For instance, the profile satyr-head finials of the cresting and Venus scallop-shell apron feature in Bérain's designs for the hôtel de Mailly (F. Kimball, The creation of Rococo Decorative Style, Ontario, 1980, figs. 39-41), as do the symmetrical lambrequin-draped pedestals (ibid, fig. 42). The trellis and use of acanthus in shaded strapwork arabesques is displayed in the background of the potrait of Le Grand Dauphin dans son cabinet, a room which Bérain was responsible for, which now hangs in the Musée National de Versailles. A related arabesque panel at the château de Réveillon, attributed to Claude Audran, similary centered by an oval medallion depicting one of La Fontaine's fables, was commissioned by Jules-Robert de Cotte, the son of Louis XIV's surintendant des Bâtiments, circa 1730 (illustrated in J. Whitehead, The French Interior in the Eighteenth Century, London, 1992, pp.102-3). Although the sitters remain tantalizingly unidentified, the portrait on the extreme right is reputedly that of Madame de la Rochefoucauld. A related screen with the arms of the duc d'Orléans, although of more rococo design and not dated, was sold anonymously at Christie's London, 15 December 1983, lot 89.